I have a calendar on my desk. 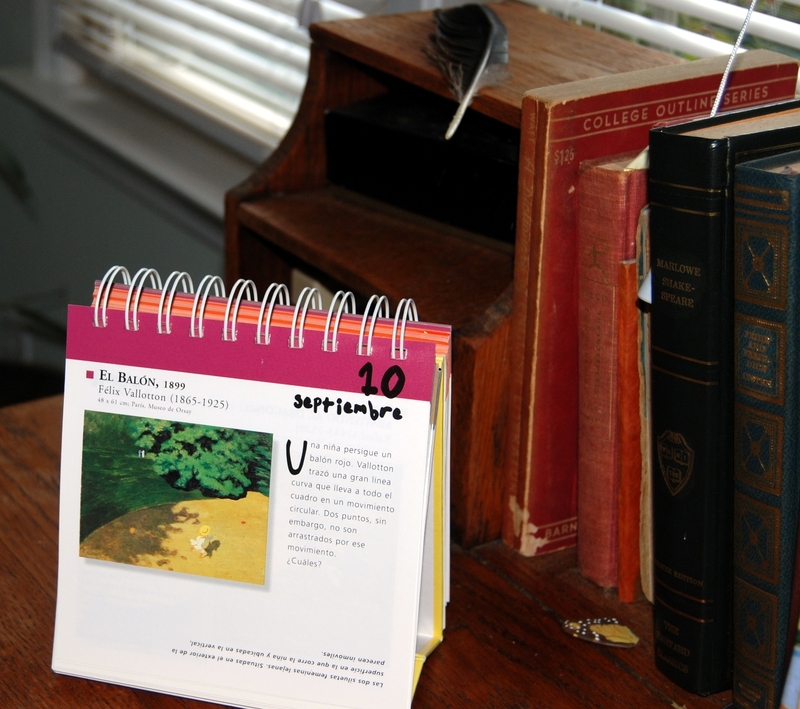 It’s a perpetual calendar, with photos of world masterpieces in art museums. I could tell you which museums, except that I don’t read Spanish. This calendar has been on my desk for several years. I like it. I even turn its pages once in a while. But you wouldn’t have noticed it in my clutter. Recently, I cleaned off my desk, and Emily noticed my calendar. “Cool!” she said, or maybe “Awsome!” or maybe just “Hey, I like this!” She said whatever monolingual eighteen-year-old American girls say when they see a calendar with 365 works of art and all the words in Spanish. So, I thought, aha! Idea! I will buy one for Emily, and surprise her. 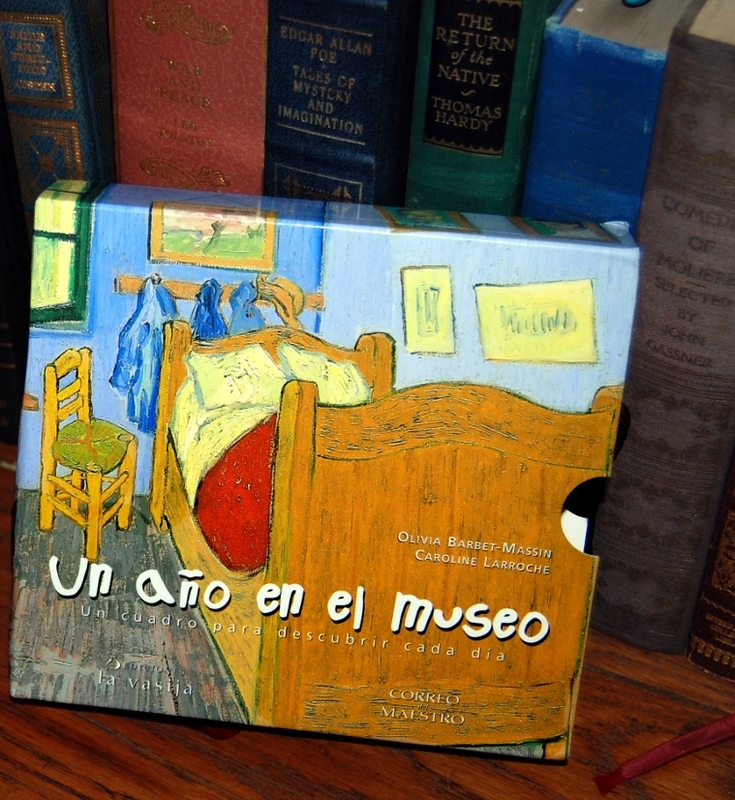 Next day I set about the task of finding a copy of Un ano en el Museo. and published by Correo del Maestro. ISBN# 9685142025. Here it is – I opened it to a pretty page. But to get back to my task – I’m not a bad googler, and I usually find what I want. But I can’t find this calendar. I did find a picture of it, but not accompanied by an order form, or an email address, or a telephone, and besides, the site was in Spanish (see paragraph #1). After trying longer than a person with better sense would, I decided this was not working out and that, as all enlightened people know, there is more than one path to the true calendar. I would find another way. The next day I put the calendar into a plastic bag, so that I could wrap it around the handle bars (my bicycle doesn’t have a basket) and I rode my bicycle over to Wake Forest University, which is within bicycling distance even for me. Logic being, they know how to speak all sorts of foreign languages over there, and they have a bookstore which means they know how to order things with ISBN numbers. I was directed to Lizzie, who orders things. Lizzie looked at all the clues, and said she’d get back with me. A few days later, she did. She can’t find it. Librarians know everything. Especially things with ISBN numbers. And what they don’t know, they know how to find out. Most of the time. But not this time. She did, however, find the email address of the publisher. And a picture of a similar calendar in French (but no ordering information). I thanked my good friend for getting a step closer, and I sent email (in English) to Correo del Maestro. As my hopes for a response diminish, I try Plan C.
Which is to write this. If all three of the people who occasionally read my blog would mention this to three of their friends, and those people do the same, someone will find this calendar, and I can order it. mind posting the ISBN? i doubt i’ll get farther than yourself and your helpers, but i’m intrigued. oh, and i only speak american hick. The ISBN # is posted about a third of the way down. Easy to miss I’m sure. After the author names, above the first photo. I bet Emily will enjoy reading about your efforts as much as she would enjoy the calendar. – And so now you can just buy her the iPad; it has a calendar too. Me gusta el calendario, “Un Ano en el Museo” y quiero pagar te par un copia. Come puedo hacer lo? I like the calendar, “One Year in the Museum” and I would like to pay you for a copy. How can I do this? “Recuerdo de Mortefontaine” means “Remembering Mortefontaine” (that’s a region in France, I think). But I don’t think the painting on the page you’ve got open is “Recuerdo de Mortefontaine,” is it? I’ve been to Spain. The big museum there is the “Museo del Prado,” where they had some exquisite paintings in 1985, when I went. If you want something translated, write it out and I’ll do my best. Spanish is my native language. Problem is that when I go to send a message on that link (the link on the right), it won’t let me b/c it wants to send it through a Microsoft Email I no longer have access to. I E-mailed what I think is the publisher and if they write me back, I’ll let you know what they said. I asked them how you could purchase a copy. home and checking this out.